Shockwave therapy was first used mostly in urology to break down kidney and gallstones. Later the shockwave became more popular in a physiotherapy when it was found the therapy was effective also in treatment of muscle and tendon injuries. Still, in physiotherapy shockwave is relatively new, though in the early 2000 century single machines were also used by physiotherapists. There was more rapid increase in number of machines in 2014. Shockwave is purely mechanical treatment and doesn´t contain electricity or heat. The machine produces pressure waves, resulting in mechanical, nervous and biological effects. 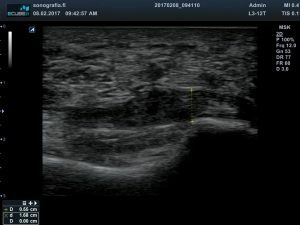 Usually the main goal is to reduce pain and increase joint range of motion in subacute an chronical soft tissue injuries. Especially when containing degenerative changes in attachement areas. In those cases shockwave may offer good alternative to surgery or corticosteroid injection. Shockwave- i.e. pressure wave treatment is also called: Extra corponeal shock wave therapy (ESWT), radial pressure waves (RPW) and radial shockwave. Focused form differs a bit and it belongs outside this text. The machine contains main unit and a treatment head. Compressor produces pulsed pressure to treatment head, which makes small piece of metal to move back and forth at the end of the treatment head. By pressing the treatment head against the skin, the mechanical energy is moved into the tissue where it effects 4cm (maximally 6cm) in depth. The therapist can choose the size of the probe (metal) and choose the power, frequency and number of hits. Those are the most essential adjusts of the machine. 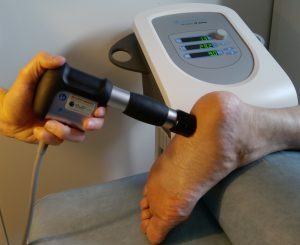 Shockwave treatment begins with examination. 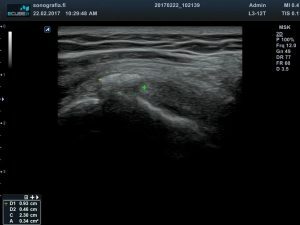 Ultrasound may help in locating the injury place and type. For example in minor tear, the treatment can be initiated more carefully, perhaps later. In larger tear, ultrasound can give reason for sending the patient to doctor for more thorough examination. Before shockwave therapy some gel is spread on skin to reduce friction and enhace maxium power to enter the tissues. Patient can feel some pain but it is tolerable. If pain is too big, therapist can easily lower the power. Extra tool is a massage probe which can be connected to the machine. Massage type of treatment is more convinient and can be used e.g. to relax painful muscle tissue. Typical dosage is around 2000 (1000-5000) hits, for example 1o Hz frequency, 5-10 min. Duration of treatment depends especially on size of treatment area. Treatment can be combined to movement as well (see youtube video). Shockwave has often immediate effect on pain and joint range of motion. Treatment can cause some soreness, redness etc afterwards, which usually goes away soon. One of targets of treatment is to cause controlled inflammation, but NSAID should be avoided if pain is not too big. It´s adviced to avoid hard exercise afterwards for treated area at least for a couple of days. Typically treatment is done once a week, 3-6 times. Muscles can be treated more often, 2-3 times a week. For example in tendon injuries it may take 6-12 months to receive maximal result, because slow metabolism and circulation in tendon make regeneration slow. During regeneration extercises are recommended to strenghten the tendon and causes should be eliminated too.